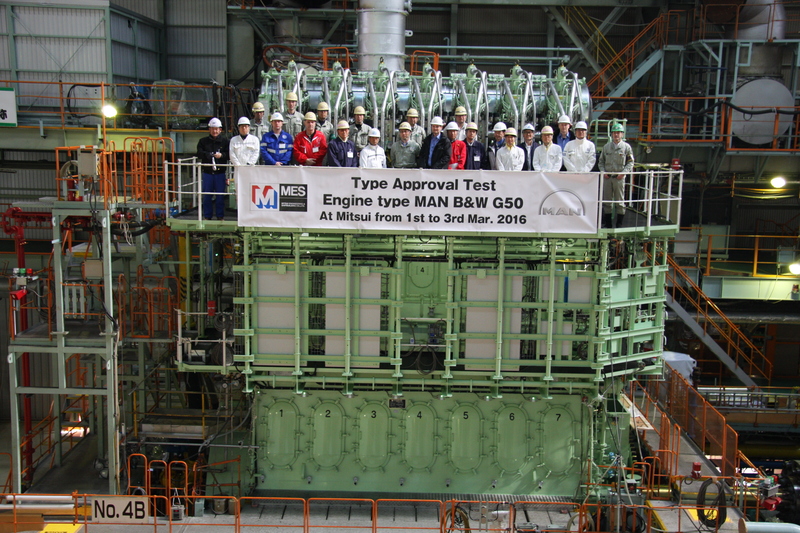 MAN Diesel & Turbo’s G50 engine has successfully passed its Type Approval Test at Mitsui in Japan. Upon entering service, the engine will power the world’s first ethane-fuelled eco-friendly LEG (Liquefied Ethane Gas) carrier – the first of three such vessels to be built in China by SinoPacific Shipyard for the German shipowner, Hartmann Reederei. Besides operating on ethane, the flexible ME-GI engine will be able to operate on HFO, MDO and gas oil. Propulsion efficiency will be further improved by employing an MAN Kappel propeller with rudder-bulb system. The G50-type has been developed with an eye on reducing production costs and accordingly features a lower weight and shorter length than its predecessor, while still being able to boast the same power output. The DNV-GL classification society oversaw proceedings in Japan where the engine was tested as an ME-C type running on MGO but its gas system also successfully completed a pressure and function test. The first test and operation on ethane gas will take place after loading in Texas aboard the 36,000 m3 LEG carrier once ethane gas has been bunkered, after which the engine will officially be named a 7G50ME-GIE (Gas Injection Ethane) type. 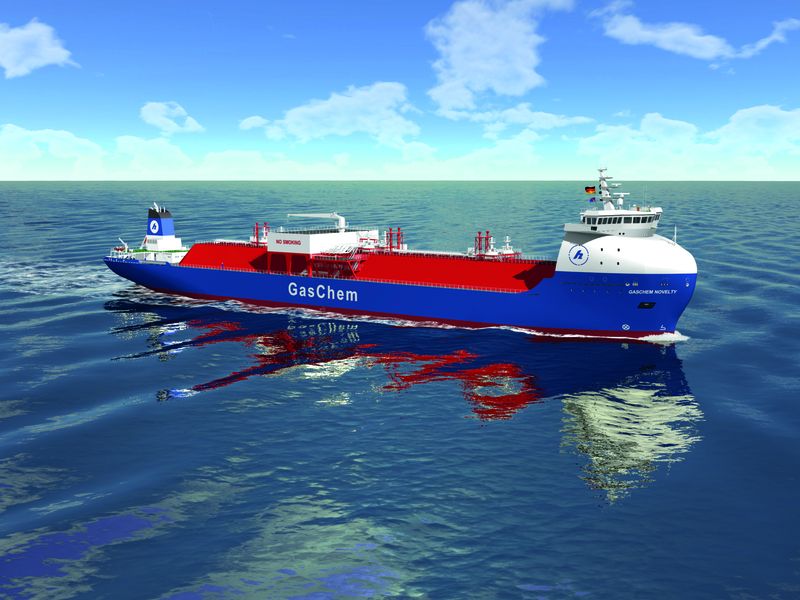 The news of the successful TAT follows the announcement by a JACCAR/Hartmann Reederei joint venture that has ordered another 5 × 85,000 m3 ‘Eco Star 85K’ Very Large Ethane Carriers (VLECs) with each vessel to be powered by a single MAN B&W 6G60ME-GIE main engine. In addition these latest 5 vessels will be IMO Tier III NOx compliant through the use of MDT’s proprietary EGR, Exhaust Gas Recirculation System. This latest order brings the total of ethane-burning ME-GIE engines on order with MAN Diesel & Turbo to eight with, the company reports, more in the pipeline. The ME-GI Dual Fuel Low Speed Diesel Engine represents the culmination of many years’ of development work. Depending on relative price and availability, as well as environmental considerations, the ME-GI engine gives shipowners and operators the option of using either HFO or gas – predominantly natural gas. MAN Diesel & Turbo has also developed an ME-LGI version of the new technology that is capable of operating on methanol, and is currently developing an ME-LGI version capable of running on LPG, the latter being deliverable from Q2, 2018. MAN Diesel & Turbo sees significant opportunities arising for gas-fuelled tonnage as concerns about both CO2 and SOx emission increase. Indeed, research indicates that the ME-GI engine delivers significant reductions in CO2, NOx and SOx emissions. Furthermore, the ME-GI engine – in contrast to competing engines – has only a negligible, unburnt gas slip, consequently adding very little to the greenhouse effects of such slips. In addition, the Diesel combustion principle leaves no formaldehyde emissions. All together, this makes the ME-GI engine series the most environmentally-friendly technology available for marine propulsion. Hartmann developed the so-called ‘Ethylene Carrier Eco Star 36K’ in cooperation with engineering consultants HB Hunte Engineering and has already concluded a long-term agreement for the newbuilding and its sisters with Saudi Arabian petrochemical company, SABIC. The new vessel type differs fundamentally from conventional gas carriers with its superstructures located at the bow, giving an optimised distribution of weight and a concomitant reduced demand for ballast water, leading to reduced fuel consumption and emissions. The new ‘Svelte’ bow design enables the vessel to improve seakeeping at higher transit speeds and also improves fuel efficiency. Another significant feature is the carrier’s innovative ‘Star Trilobe’ tank that allows an increase in cargo capacity by nearly 30%, reducing shipping costs through economies of scale. The new vessels offer a cargo capacity of 36,000 m3 each for liquefied gas cargoes down to -104°C. Presently, these vessels are the largest LEG-carriers worldwide, only to be surpassed by the larger vessels in the new 5-vessel series previously mentioned.